In 1884, in the city of Madaba, Jordan, an ancient floor mosaic was discovered in the ruins of a long-abandoned Byzantine church. Containing millions of tiny tesserae, the mosaic depicted important locations of the Middle East, including Jerusalem, the Jordan River, the Dead Sea, Mt. Sinai, and the Nile Delta. Greek text fills the empty spaces, explaining the religious significance of various locations throughout the area. Based on the buildings present in the map’s view of Jerusalem, it was determined that the mosaic was created some time between 542 and 570 A.D., which makes it the oldest surviving map of Jerusalem and the biblical Holy Land. The mosaic was restored as well as it could be, but the original colors have faded and some of the pieces are missing. There are, however, numerous colorful reproductions. Below is a section from one of these reproductions, which shows Jerusalem in a prominent central position, and the Jordan River flowing into the Dead Sea at the top. This mosaic may have served as a guide for Christian pilgrims traveling to Jerusalem and other biblical sites during the early middle ages. 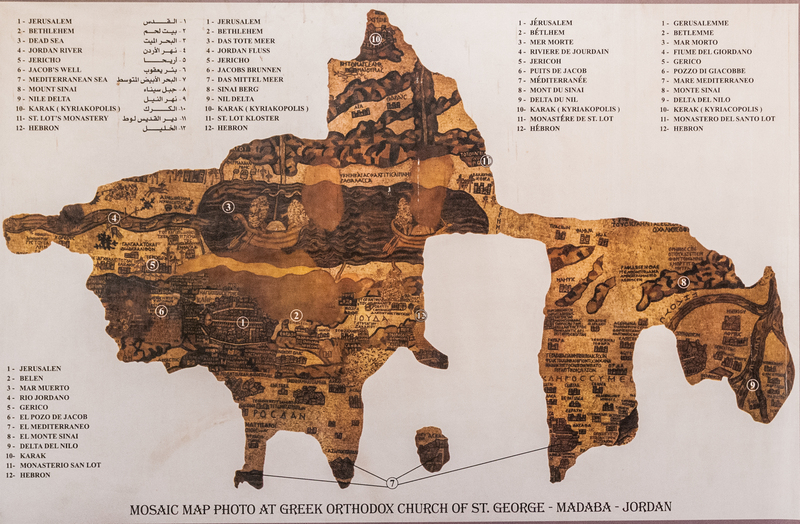 The Madaba Mosaic can be a little disorienting at first. The full view, shown above, has several large chunks missing, including most of the Mediterranean Sea. In addition, we are used to maps having North at the top, but this mosaic, like so many from this era, has East at the top. Even accounting for that, the orientation still does not quite make sense to me. 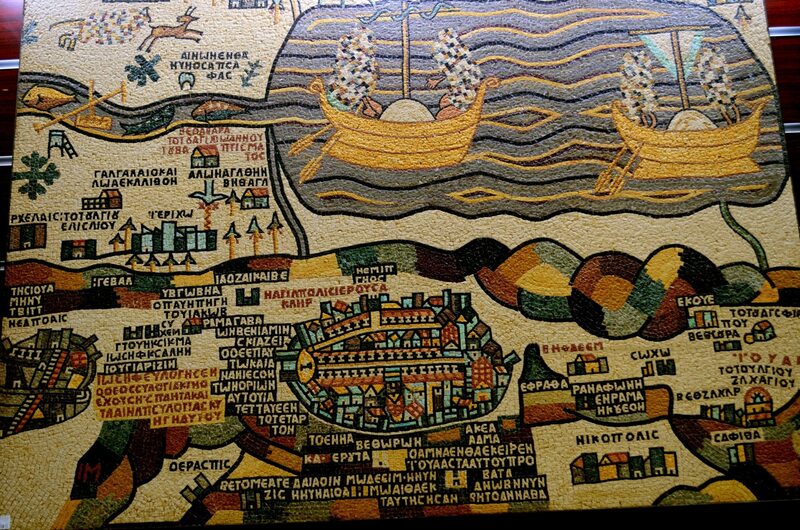 The Nile River delta is located in the bottom right corner of the mosaic, but Jerusalem is on the left side of the mosaic. In real life, Jerusalem is East and a little North of the Nile River delta. Shouldn’t the Nile be underneath Jerusalem on this mosaic? Perhaps someone with more cartographic expertise could shed some light on this. Today, the Madaba Mosaic is not useful for anything more than artistic appreciation. When examining it, though, I do get the sense that it was a very impressive cartographic depiction at the time it was made. The locations included are rather extensive, and if I could read all the ancient Greek, I would probably be even more impressed with the biblical information cited. The mosaic was not in use for very long, because Madaba was conquered by the Persians in 614 A.D., then the Muslims in the 8th century, and finally the city was destroyed in an earthquake and abandoned in 746 A.D. But during the mosaic’s relatively brief life, I am sure that it helped many a traveler find his way to Jerusalem. April 24th marked the 100th anniversary of the start of the Armenian Genocide, the systematic killing of as many as 1.5 million Armenians by the Ottoman Empire. It remains a controversial topic, since Turkey, as the successor state of the Ottoman Empire, has refused to acknowledge that genocide occurred, and many of Turkey’s allies (including the U.S.), will not recognize it either, for fear of offending Turkey. It is a shame that politics has gotten in the way of widespread recognition of what really happened, because only through recognition can we heal the wounds of the past and prevent such massive tragedies from recurring. That is why I would like to take on a more serious topic than usual this week, and present a few maps which help to explain the situation in Armenia before, during, and after the genocide. The Armenian nation stretches back to antiquity, although the size of its reach has shifted greatly over the millennia. From 83 to 69 B.C., the Armenian Empire held its largest swath of territory under Emperor Tigranes the Great. As the map below shows, Armenia stretched from the Caspian Sea to the Mediterranean, including parts of modern-day Turkey and Syria. However, the Armenian Empire soon lost territory to the expanding Roman Empire and never was able to regain it. In later years, the Armenians were invaded by several other large empires, such as the Seljuk Turks in the eleventh century. 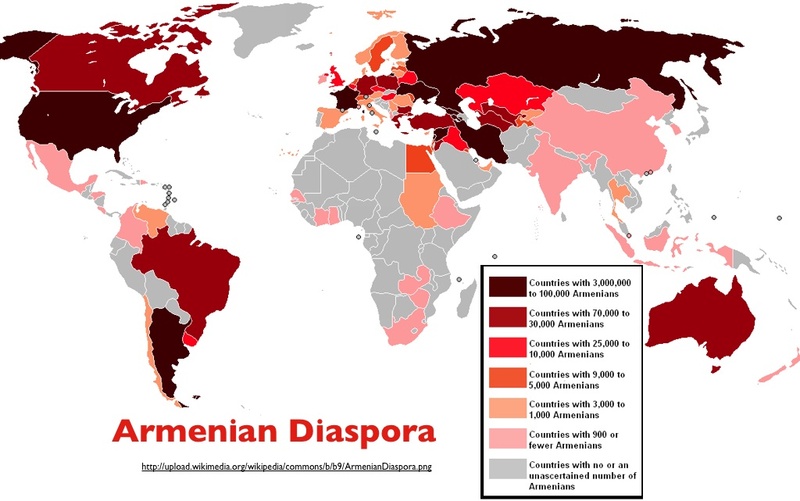 Great numbers of Armenians fled their homeland and settled in other countries of Europe, although many did stay, even though they were often not in control of their own land. On the eve of World War I, the the Armenian homeland was controlled by the Ottomans, but the Armenians had begun fighting for their independence, just as the Greeks before them. The Ottomans would not let them go easily. This map shows the extent of the ancient Kingdom of Armenia (orange), areas where Armenians were living before the Genocide (shaded), the current nation of Armenia (red), and parts of neighboring countries where significant populations of Armenians live today (lighter red). As you can see, large parts of the then-Ottoman empire had high percentages of Armenians living there, although this is no longer the case. An ethnic group does not suddenly vanish off the map by accident. Although Turkey claims that these Armenians died from a civil war, the evidence is clear that an organized, coordinated genocidal plan was enacted on the part of the government. In a similar fashion to the Holocaust, Armenians were deported along specified routes in order to be executed together in designated areas. As a result of the genocide, the Armenian presence in the area known as “Western Armenia” in Central Anatolia was terminated after over two thousand years. After World War I, in 1918, Armenia declared itself an independent nation, which the Ottoman Empire, defeated and on the verge of collapse, accepted. The new nation’s territory, however, only included the smaller, Eastern section of Armenia’s historical homeland. 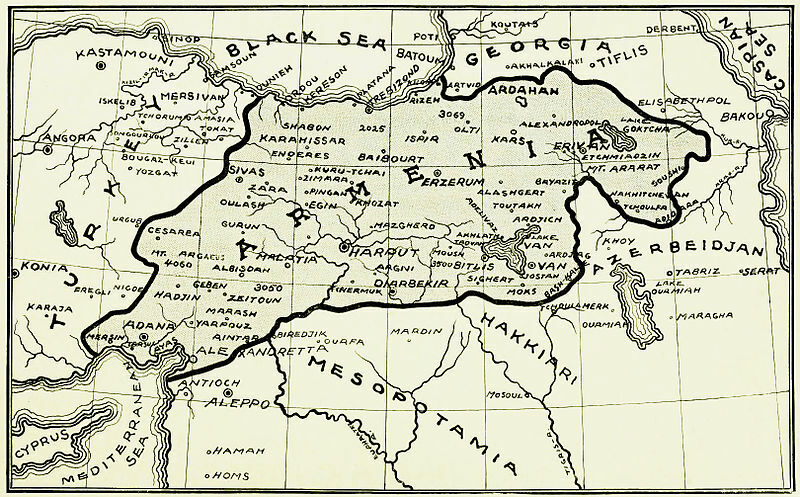 The map below, presented by the Armenian National Delegation to the 1919 Paris Peace Conference, shows that Armenia was hoping to achieve much more. 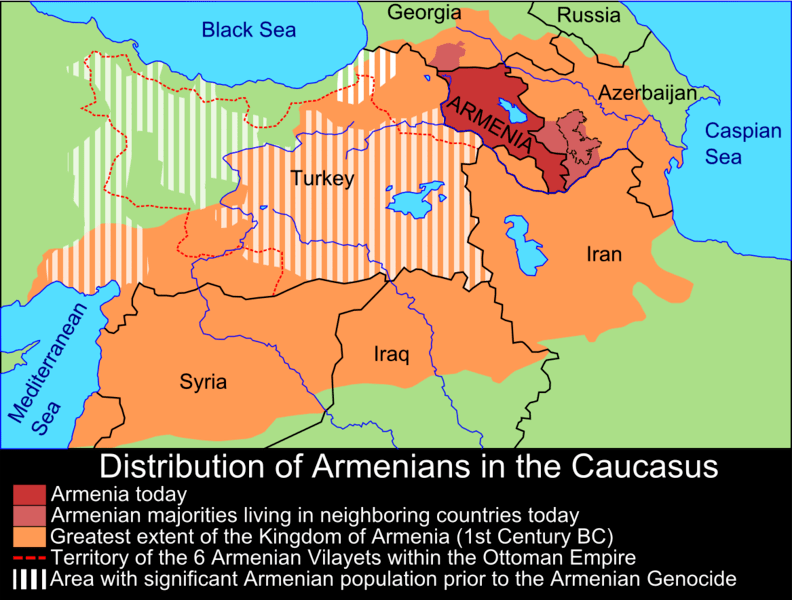 Subsequent wars between Turkey, Armenia, and Soviet Russia changed the borders of the Armenian nation several more times during the 20th century. Border disputes in the region are still ongoing, including one between Armenia and Azerbaijan. Most significantly, though, Armenia is still claiming the Western Armenia region of Turkey. Armenian activists believe that achieving recognition of the Genocide is one important step towards achieving this. However, as I explained earlier, Turkey’s many important allies around the world have made greater recognition difficult. The genocide suffered by the Armenians was one of the first in modern times, but it was far from the last. Each time a tragedy on this level occurs, we hear the refrain of “never again!”, and yet, such ethnic extermination has been a recurrent evil over the past century. Rather than ignore or downplay what has happened, it is better to acknowledge it and move forward through peace and reparations, lest the cycle of violence continue. It has been 100 years without Turkey’s recognition of the Armenian Genocide, but it is still not too late. The 17th century was an exciting time for cartography, as explorers criss-crossed the oceans and delved deep into unspoiled continents. World maps were being updated on an almost annual basis as the empty parts of the Earth were gradually filled in with new discoveries. But the wider world beyond the Earth still remained largely mysterious and speculative. Using state-of-the-art telescopes, astronomers could observe most of the planets and theorize about their movements, though they often disagreed on the structure of the universe. It would be centuries, after all, before anyone (or anything) from Earth could go and get a closer look. And yet, that did not stop anyone from trying to map the universe. One such ambitious man was Andreas Cellarius, who lived in Germany and the Netherlands from 1596 to 1665. His Harmonia Macrocosmica (Cosmic Harmony), created in 1660, was one of the most prominent cosmic atlases of the time, employing gorgeous art with meticulous detail to illustrate the position of the Earth in space. Following in the tradition of Ptolemy, Cellarius placed the Earth at the center of his cosmos, despite that fact that Copernicus had shown a century earlier that the Earth revolved around the Sun. The Earth itself is wonderfully drawn. It shows the extent of European knowledge of the world in the mid-17th century, with a half-finished Australia and purely speculative Antarctica. The lines representing the Equator and the Tropics of Cancer and Capricorn cross the Earth and continue outwards to encircle the surrounding space as well. Cellarius depicts the planets (minus Uranus, Neptune, and Pluto), plus the Sun, all revolving around the Earth with their corresponding celestial symbols next to them (e.g., a circle with an arrow for Mars). Finally, the map includes the 12 signs of the Zodiac in the multicolored ring around the Earth. According to the map, as the Sun completes its circuit around the Earth, it moves through each Zodiac sign, which the astrologers will argue poses significance to the events of our lives. One more thing to note: look at the corners of the map. Populated by floating cherubs at the top, and ancient philosophers and cartographers at the bottom, these illustrations reinforce the point that this cosmic atlas does not exist in a vacuum. Rather, this atlas is the result of a long-standing cosmographic tradition stretching back to Ptolemy, and the angels show us that the heavens of the map cannot be separated from the concept of heaven itself. Today we’ll take a look at maps of Canada. Some might ask “why?”, but I think the better question is, “why not?” I think Americans in general don’t pay enough attention to Canada, even though the U.S. and Canada share the longest continuous land border in the world. As occupants of the same continent, possessing similar economic and political interests, it makes good sense for Americans to learn more about our neighbors to the North. Canada has a long, rich history, from its colonization by France in the early 17th century, to its acquisition by the British Empire in the wake of the Seven Years’ War in 1763, and finally to self-governance as a constitutional monarchy while retaining Queen Elizabeth II as head of state. Let’s check out just a few of the fascinating maps of Canada from its early days as a French colony. Starting off, there is the first map with the name Canada on it. 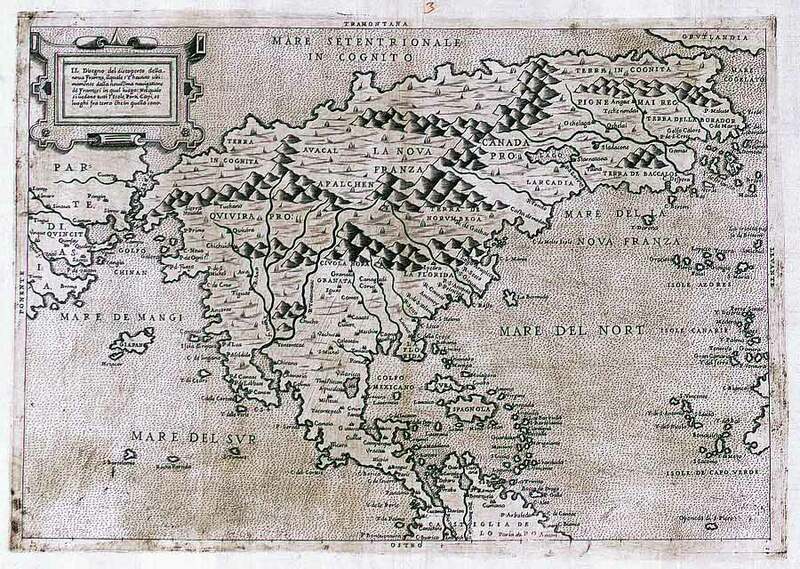 This was made in 1566 by Italian cartographer Paolo Forlani, before France had set up any permanent settlements in the region. Even at this early date, however, you can still see some familiar names, such as Florida, Bermuda, Nova Franza (New France), Larcadia (Arcadia), Laborador (Labrador), and of course, Canada Pro, or proper, written in the space underneath a mountain range to the east of “Nova Franza”. It is remarkable how even in vast expanses of terrain where European colonizers had not yet established settlements, they still managed to fill up the land with placenames. Second, there is one dating from 1613, shortly after Quebec City had been founded in 1608. 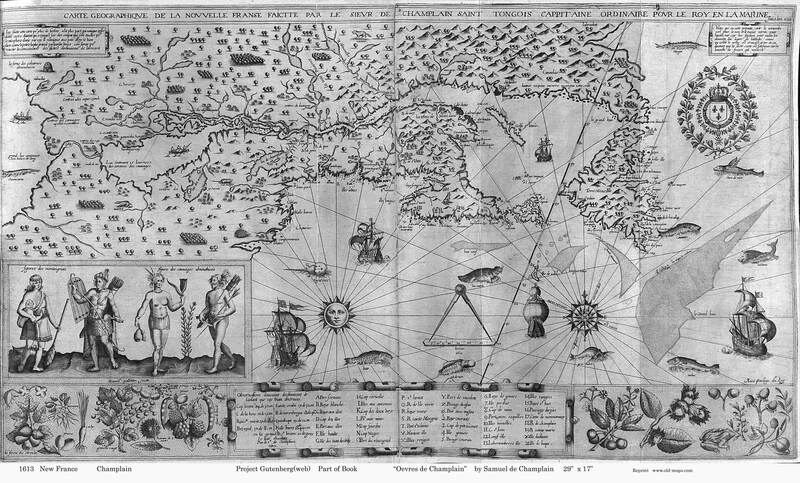 Produced by the explorer Samuel de Champlain, it features the latest geographical discoveries in the land that would become Canada. 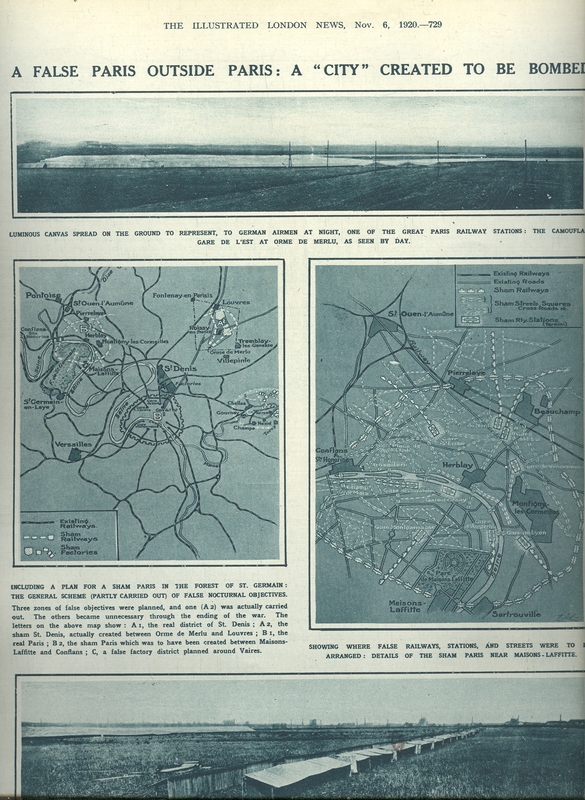 The map serves partly as an advertisement to encourage settlement; it includes pictures of local flora and fauna, depicting the new territory as bursting with natural resources that are waiting to be enjoyed. Notice how the map includes parts of the coastline of what would become upper New England, but it is difficult to recognize because there have not yet been any settlements. We are still a few years ahead of Plymouth and the First Thanksgiving. Finally, we have a map created by British cartographer John Barrow in 1759. At this time, Britain and France were still fighting the Seven Years’ War, and Canada was still in French hands, though not for long. The map shows the extent of Canadian possessions in the east, as well as some of the Northern territories of the thirteen American colonies, which would be shaking off British control a couple of decades in the future. 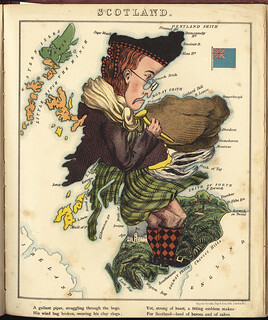 Barrow probably did not realize that the world he was depicting on the map would not last long, with the French lands turning British, and most of the British lands becoming independent. Thanks for joining me on this brief cartography journey through early Canadian history. 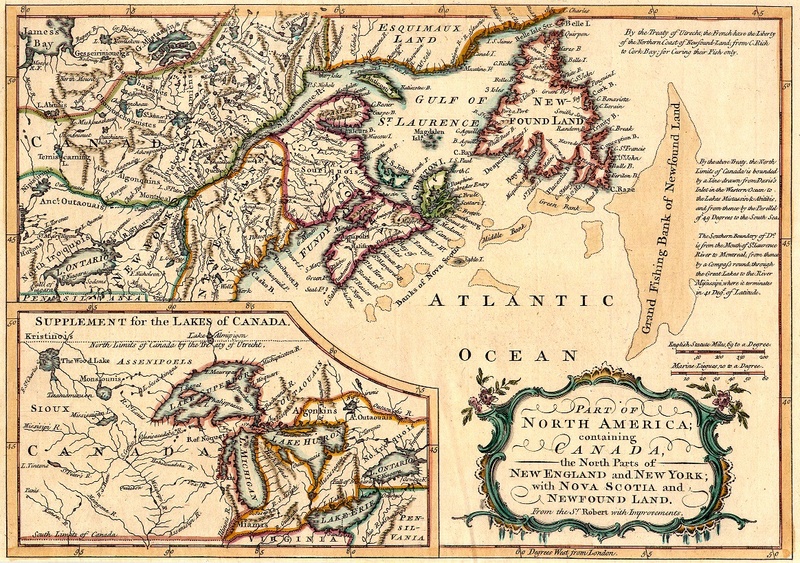 For more on these maps, check out these sources: All About Canadian History Blog, The Newfoundland and Labrador Historic Map Archive, and Barry Lawrence Ruderman Antique Maps Inc. This past week, one hundred years ago, World War I began as Austria-Hungary declared war on Serbia and drew the other nations and empires of Europe into the conflict. The war drastically changed the course of the twentieth century, and the peace that was negotiated at the end unwittingly set the stage for World War II just two decades later. 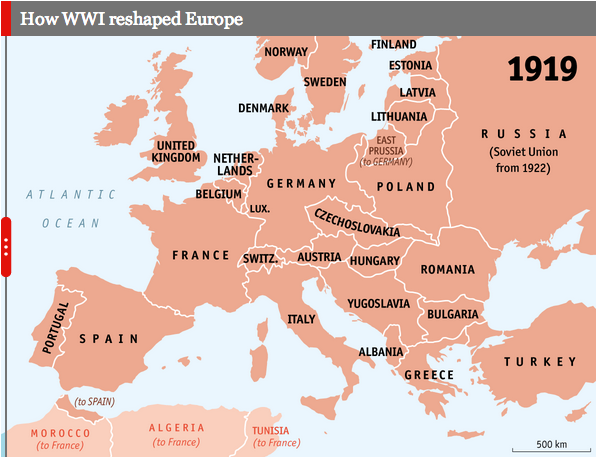 In particular, it radically changed the borders of Europe, such that the map of Europe in 1919, after the Treaty of Versailles, was vastly different from the map in 1914. Border changes over the space of those five years were both great and small. France and Denmark gained some territory at the expense of Germany. The Austro-Hungarian Empire disappeared completely, succeeded by various smaller states (some of which would break up further later on in the century). States which had previously not been independent, such as Poland, were able to reassert their independence. 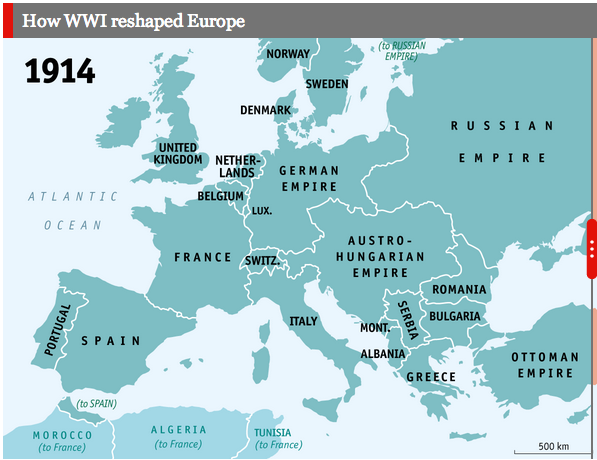 The map shows how Germany in particular was punished by the allied powers at the end of the war. What it does not show, of course, is the level of economic reparations levied against Germany, and the level of wounded pride the nation suffered, which laid the seeds for the rise of Hitler in the 1930s. 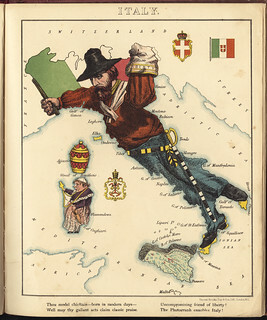 Italy: “Thou model chieftain – born in modern days – Well may thy gallant acts claim classic praise.” Italy is dressed a revolutionary figure, as this map was drawn right after the Third War of Independence and right before the final unification of the peninsula. Germany: “Lo! studious Germany, in her delight, At coming glories, shown by second sight…” Germany is an unfamiliar shape here, because Prussia occupied a great deal of land that would eventually become part of Germany. 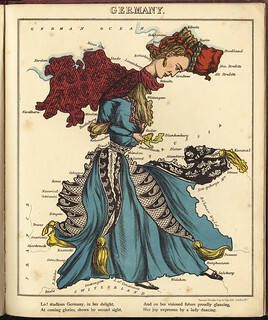 As such, Germany looks squeezed at the middle, much like a woman in Victorian dress squeezed at the waist by a corset. 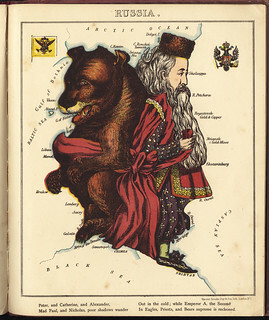 Russia: “Peter, and Catherine, and Alexander, Mad Paul, and Nicholas, poor shadows wander out in the cold; while Emperor A. the Second in Eagles, Priests, and Bears supreme is reckoned.” It looks like the czar and the classic Russian symbol of the bear are tied together. But what about all of Russia’s land in Asia? Surely there’s more room to stretch out? 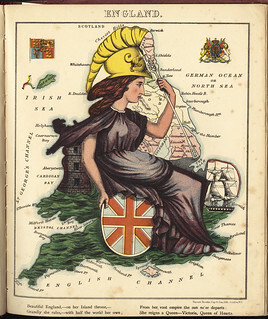 England: “Beautiful England, – on her Island throne, – grandly she rules, – with half the world her own…” England, in the visage of Queen Victoria, appears stoic and assured. After all, the sun never set on the British Empire at the time. Scotland: “A gallant piper, struggling through the bogs. His wind bag broken, wearing his clay clogs. Yet, strong of heart, a fitting emblem makes for Scotland – land of heroes and of cakes.” Dressed in the traditional kilt, Scotland looks cold and anxious. Maybe he’s planning to seek his independence? For more of these maps, check out the flickr page here: https://www.flickr.com/photos/normanbleventhalmapcenter/sets/72157632187636362, and for more on the atlas, go here: http://memory.loc.gov/ammem/gmdhtml/geofun.html. Chicago in 1931 was a gangster’s paradise, full of illegal speakeasies, corruption, violence, and all other sorts of vice. At least, that’s what this map of Chicago from 1931 wants to make very clear, in the hopes of dissuading young people from falling into sinful activities. This explicit purpose is spelled out in the legend below, which floats authoritatively over Lake Michigan on the map. 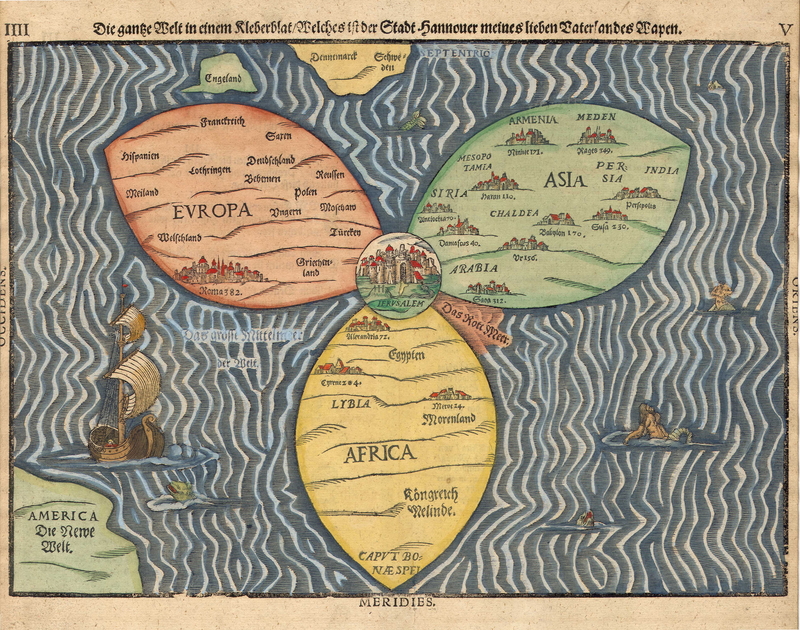 The map itself, shown below, looks like it was lifted right out of the Middle Ages, when cartographers placed more importance on the moral and theological dimensions of reality than geographical accuracy. But instead, it was the product of the 1930s, when prohibition allowed organized crime to become an extremely profitable and powerful force in the city. This was the era of Al Capone and the St. Valentine’s Day Massacre, both of which are mentioned on the map. Liquor bottles and skulls and crossbones are scattered abundantly throughout the city, emphasizing the dangers that lurk in every corner. Zoom in to the map and see what else you can find. For example, even the giant fish in Lake Michigan is gulping beer that runs over the side of a huge mug. It’s funny to see such a moralistic map today, but it makes sense that they took these issues very seriously back then. It really did seem like violence and corruption were tearing the city apart, and the map’s creators wanted to influence the reader to help turn the city around. It’s not just a map, but a powerful argumentative tool. Desperate times call for desperate, and sometimes highly creative, measures. And the French, during World War I, had one of the most ingenious ideas I’ve ever seen. 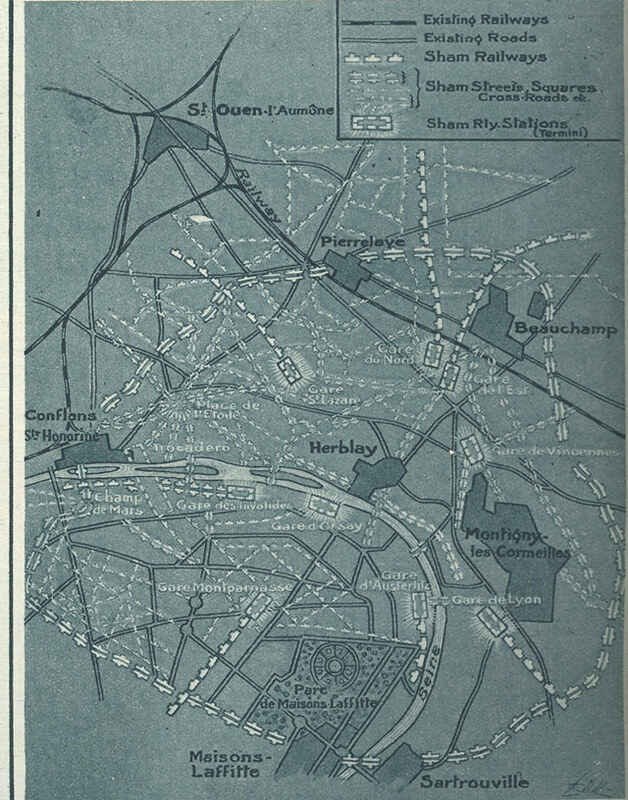 They actually designed and partially built a sham Paris on the outskirts of the real Paris, hoping that German bombers would become disoriented and bomb the fake city instead. They even outfitted Sham Paris with electric lights lining the streets and fake railway stations in order to draw the enemy there and away from the real Paris. From the start, Sham Paris was a city built purely to be destroyed. Since flight technology was still rudimentary, and radar was not yet in use, it was easier then it would be today to confuse the bombers. One can imagine the pilot sitting in the plane ready to drop the bomb, scanning the ground for the target “city of lights”, and being understandably duped by the fake city instead. However, we cannot know how effective it might have been, because the city was actually not completed before the end of the war in November, 1918. It was then revealed to the world in a 1920 newspaper article, seen above, and would therefore never be put to use. Nevertheless, it was still an awfully clever idea, and yet another testament to the power of cartography (even though in this case it is the power to confuse, rather than enlighten). Cinco de Mayo commemorates the Mexican victory over the French army at the Battle of Puebla on May 5, 1862. Today, many Americans use the occasion primarily to celebrate Mexican pride, and so the history behind the holiday is often forgotten. But it’s very interesting how it relates to what was going on in the United States and around the world at the time. The French, led by Emperor Napoleon III, decided to invade Mexico at that time because the U.S. was embroiled in a bloody civil war and would be unable to stop them. Until that time, the U.S. had been able to keep the European powers out of their sphere of interest under their Monroe Doctrine, declared by President Monroe in 1823. 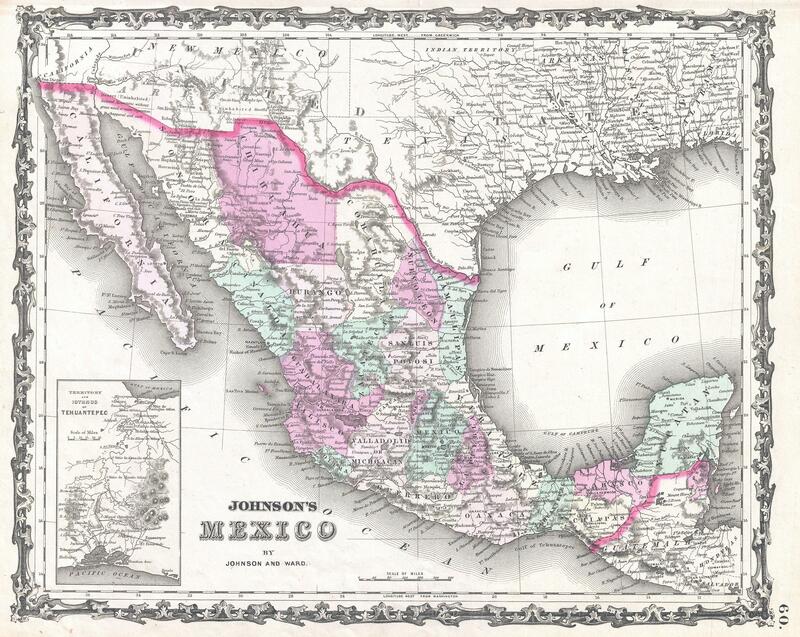 But now that the U.S. was weakened and divided, the imperialistic French took the opportunity to make their play for Mexico. What they did not count on was the tenacious spirit of the Mexicans. The Battle of Puebla on May 5, 1862 was a decisive victory for the vastly underpowered Mexican army. Unfortunately, their success was shortlived, as the French retaliated and eventually prevailed, installing Emperor Maximilian as their puppet ruler of the new regime. It was not until 1867 that the French regime was overthrown, Maximilian was executed, and the Mexican republic was restored. By that time, the U.S. had ended its civil war and regained its ability to dissuade France and other meddling Europeans from invading Latin American countries. So now when you’re enjoying a cerveza on Cinco de Mayo, keep in mind the true meaning behind the day and let your battle cry ring out: Remember the Battle of Puebla! What better way to honor your homeland than to create the whole world in its image? That is essentially what 16th century German cartographer Heinrich Bünting did. In this 1581 map, “Die gantze Welt in ein Kleberblat”, Bünting arranged the world in the shape of a clover leaf, which is the emblem for his home city of Hanover. Sure you can’t use the map to guide you from Point A to Point B, but that’s not the point of it. The Clover Leaf map exists as symbolization, reflecting both the city of Hanover and the devout Bünting’s theological beliefs. The original map was published in Bünting’s book of biblical woodcut maps, “Travel Through Holy Scripture”. During an era when new lands were being discovered on an regular basis, and cartographic accuracy was improving at a rapid pace, Bünting looked not to the current world around him, but the world of the past. He assembled the most complete collection of biblical geography at the time, showing the Holy Land at the time of Jesus and the routes taken by important figures in the Old and New Testament. Bünting was a very popular Protestant pastor and theologian for a time, but controversy over some of his teachings forced him to retire early. As for the Clover Leaf map, the three leaves of the clover double as symbolism for the three persons of God in the Holy Trinity (this is also how the clover came to be associated with St. Patrick, because he used it to explain the concept of the Trinity to the Irish when converting them to Christianity). In the center of the clover leaf is the city of Jerusalem, which has always held a special importance for members of all three Abrahamic religions. World maps throughout the middle ages usually placed Jerusalem at the center of the world, but by the time Bünting was mapping, this had largely fallen out of favor, as new maps were shifting focus to a more objective viewpoint. Note how Bünting includes America as a little blob in the lower left-hand corner almost as an afterthought, a pesky continent that did not fit into his three-pronged view of the world. In retrospect, this map symbolizes not just the city of Hanover, or the Trinity, but the last gasp of the outsized importance placed on the three continents of the Old World, even as the shift of geopolitical power toward the New World was already underway. A Grump’s Map of the U.S. The simple thoughts of a simple mind. ...except not really. More like bits and pieces.